WordPress just randomly deleted the first round of this post… which was completed. So here we go with ROUND TWO. Recently, a friend convinced me that because I am already a very experienced cyclist, and a moderately experienced runner, that I was now ready to be a brand new beginner triathlete. And so, on Sunday August 24th, I will be competing in the Toronto Island Give-it-a-Tri race. With only 3 and a half weeks to race day, the only thing that I really needed to work on was my swim stroke. While I’ve loved spending summers swimming in lakes and the ocean since I was a child, I have never really SWAM and have usually hated the idea of swimming laps (booooring), and have avoided chlorinated pools like the plague. However the need to train so that I will not die in the opening leg of my triathlon trumped both of these things. I was wary at first, but then I discovered Toronto’s free outdoor summer pools. More specifically, I discovered Sunnyside – Gus Ryder Pool. While busy on the weekends, I’ve found weeknights at Sunnyside blissfully calm, and I’ve never had to deal with more than 2 other people in the slow lane. The pool is long and peaceful, with a deep end that allows for water treading or a long float on my back staring up at the sky as the clouds go by when I’m done my laps. Sunnyside is a quick 15 minute bike ride from my house, along side streets and the lake front. 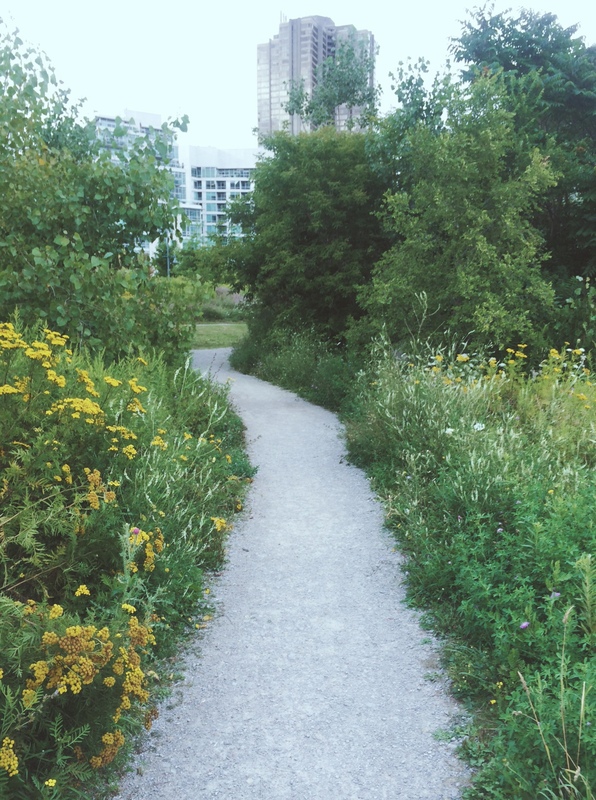 And if I decide to go for a little 5 km jog to round out my training, I can run over to a freaking butterfly habitat. It’s beautiful. As previously mentioned, on top of all of this, Sunnyside is also FREE. FREEEEEEEEEE. I know that normally swimming pools only charge about 3 dollars for admission, but it’s still so amazing to me that I can pop in for a little 20 minute swim if I’m in a hurry and it costs me absolutely nothing at all. On top of this, Sunnyside also has a pretty amazing history, but I’m not gonna’ write about that here. ANYWAYS. I don’t remember how I signed off the first time I wrote this post, but the second time around it goes something like this: next weekend, I will compete in my first little mini-triathlon, and a few short weeks after that, Toronto free outdoor pools will close for Fall. While it won’t be the same, I will reluctantly drag myself to swim my lanes indoors, paying my three dollars, so that I am better, stronger and faster when I return to summer pools next June.